In the marquee matchup of the day, Magnus Carlsen faced one of his rival with some fighting words as a preface. Carlsen stated that he considered Levon Aronian his main rival debunking the Carlsen-Nakamura rivalry talk. However, this game was high stakes and certainly the Norwegian knew Nakamura would be gunning for him. 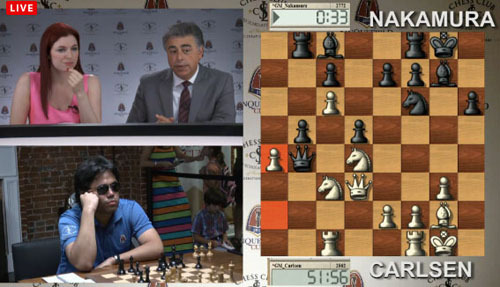 Nakamura tried something new and sported dark shades against Carlsen today, but came up short of snaring a full point. Carlsen played an unconventional setup that has recently come into vogue… the Bf4 salvo against the King’s Indian. GM Nigel Short was a bit critical of this trend and stated that Nakamura had handled it rather well. Carlsen was not surprised at 10…g5!? but 13…b5 was a move that caught him off guard. Carlsen placed his hopes on a strong pawn at c6, but that pawn was blockaded. When asked why he didn’t pressed for more, Nakamura pointed out he defensive schemes for white and stated he could have even stood worse in some cases. Nevertheless, credible result and the American holds onto first place before the rest day. Gata Kamsky was in a funk. 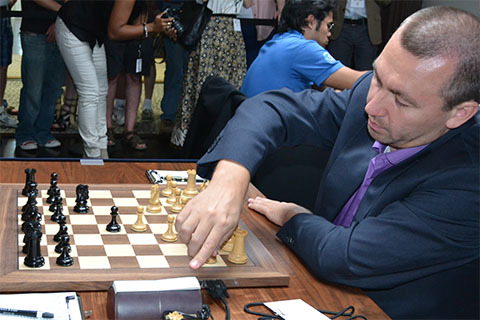 He had lost his previous two games and stated that against Levon Aronian he was attempting to stop the bleeding by making a draw. The stated that he was not in good form and sought to conserve energy for the next three rounds. Kamsky tried something new and the shock-value paid off. Kamsky played a strange move order and soon we saw another Bf4 on the board… 1. d4 Nf6 2. Nf3 d5 3. c3 c6 4. Bf4!? Nh5 5. Be3 g6 6. g3 Bg7 7. Bg2 O-O 8. Qc1 Nd7 9. Bh6 Re8 10. Bxg7 Kxg7. The game took shape but white only dreamt of an advantage as black claimed equality rather easily. In the end, the pieces melted away and Kamsky secured his draw. Nakamura is such a chop. Why wear sunglasses? He think too much of himself. Don’t like him at all. Not sure how it is thinking much of himself by wearing sunglasses, but I would imagine his he is simply trying something different against Carlsen. Not the first time he has worn sunglasses, but I would imagine he wanted to rattle Carlsen a bit to change the dynamics of their game. It’s a psychological ploy. I did it against a high school rival once. Their entire team used to wear them and it can be quite unsettling because you can’t see what they are looking at. I wanted to return the gesture. I also remember Viktor Korchnoi wearing mirrored sunglasses during his match with Anatoly Karpov. It was Korchnoi’s fear that he was being stared at by Karpov’s steely eyes and Karpov’s psychologist in the audience. Players do all kinds of things… wear strange colors, baseball caps and so on. Korchnoi wearing sunglasses during his 1974 match against Karpov. If this is his statement in his tweet , “No hypnotism, better chess” something is going on. I think Nakamura take pride in playing very innovative positions (very creative with risks and potential rewards of a frustrated opponent). I suspect that playing on the edge cause himself stress. Maybe by hiding the eyes to his soul he is trying to not give Carlsen the edge in knowing what he (Naka) knows and does not know. I was waiting to hear what Magnus had to say about the shades and when GM Ashley posed the question to him about the surprised move by Naka , I believe he said, I don’t know why he did that and smiled. Anything out of the ordinary that an opponent does can be a distraction. Nakamura chose to wear shades, but he could have employed other means to annoy Magnus. Like getting up and walk away after making every move, staring at the ceiling, making facial expression of boredom, not shaking his hand before the game, etc. All of these are tricks that can affect a players game and depending on his or her personality. It won’t be an easy task, but since Nakamura seems to be a good form, he has a good chance of winning this tournament and perhaps , he can even get a win against the brilliant Carlsen with the white pieces,. Just got into St. Louis. It will be interesting to see if he wears them again. That’s the big question. My guess is that he will skip tomorrow and wear it again in his next game against Magnus .